America’s Best Hope is about building godly leaders in the marketplace–men and women hungry to grow and lead spiritually, professionally, and personally. On November 13, you’re invited to Huntington University to view a simulcast of the 4th annual America’s Best Hope conference occurring live in Indianapolis. HU is one of 16 simulcast locations across the country. A line-up of world class speakers–including the presidents of Tyson Foods and Hobby Lobby, Christian writer Lee Strobel, and comedian Michael Jr.– will address what defines a godly leader and how to practically integrate faith and vocation. Past speakers have included Francis Chan, coaches Tony Dungy and Tom Crean, and Dr. John Townsend from Huntington University’s Townsend Institute. Time: 8am – 4 pm (doors open at 7am). Location: Merillat Centre for the Arts at Huntington University. Cost: $29. Includes lunch in the newly-renovated Habecker Dining Commons at HU. Presenting a check for $700 to Water4. L-r: Chet Conley (impact minister at First UB), Ron Monday (Mission’s chair), and Jerry Rieger of Water4. The 2015 theme for First United Brethren Church (Findlay, Ohio) is, “Whatever you do to the least of these, you have done it onto me.” In Matthew 25, part of that discourse focuses on giving a cup of water in Jesus’ name. In February, a goal was presented to FUBiC to raise $1500 for one water well for the Water4 organization out of Oklahoma City. These wells are drilled in Third World countries by the citizens of that region. When the goal was presented to the congregation, one elder proclaimed from the sanctuary that we can do even better–that we could raise enough for 10 wells. After six months, the church had raised $6270, which was enough for four wells. Jerry Rieger, director of Global Resource Development for Water4, called the church and said that since we were first-time givers, the money donated would be doubled by an anonymous donor. That donor, in turn, would be doubled by another donor. Therefore, the funds donated would be quadrupled. More funds were raised to even the donation to $7000. With the matching grants, the funds raised now stood at $28,000. This was enough for 18.5 wells. On Sunday, September 27, Jerry Regier traveled to Findlay, Ohio, to receive the donation and share a message to the church. Tara (left), Emma, and Tim with sons Isaac and Levi. Inset: Tim and Eli. Tim and Tara Hallman and all four children participated in the Fort4Fitness event on Saturday, September 26, in Fort Wayne, Ind. The Hallmans serve Anchor UB church in Fort Wayne. A number of persons from Anchor participate in the Fort4Fitness each year. 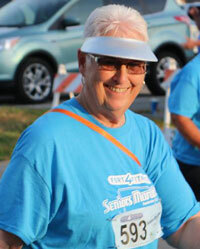 Rozanne Hallman in the seniors marathon. Tim ran the 10K event, and then ran the 4-mile event with twin sons Isaac and Levi (who tied for third in their age group). Tara ran the 13-mile half-marathon, as she has done for several years, while daughter Emma ran the 10k alongside Tara’s sister, Amy Saleh. 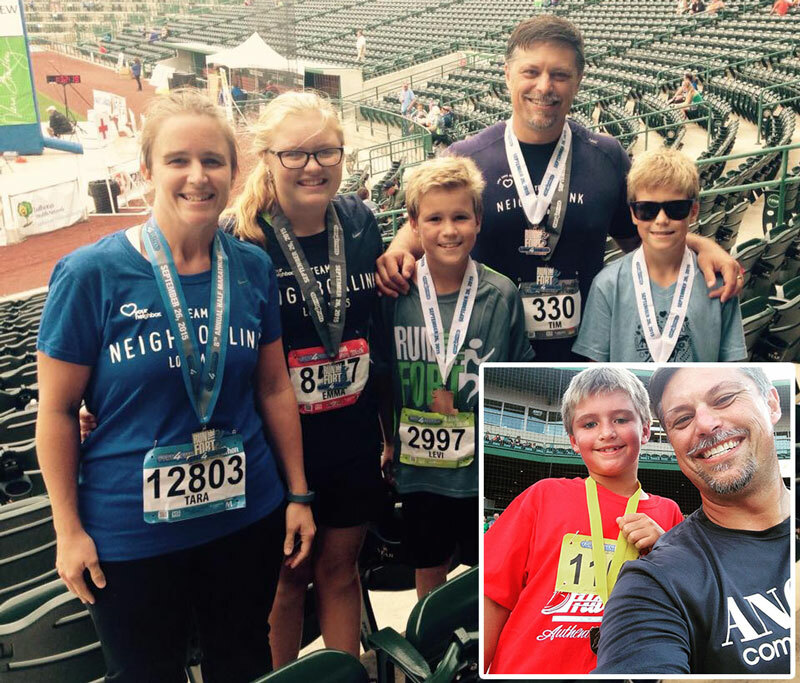 On Friday night, Tim and youngest son Eli together ran the final stretch of the children’s marathon. The next day, they all participated in the 2.2 mile Redemption House Benefit Walk in Fort Wayne. Several others from Anchor joined them. Tim’s mother, Rozanne Hallman (right), widow of former UB pastor Gerald Hallman, and his mother-in-law, Karen Johnson, participated in the Fort4Fitness senior marathon. Ellen Margaret (Bressler) Saufley passed away at 5:30 pm on Monday, September 21, 2015. 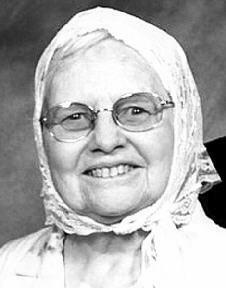 Ellen and her husband, Aldean, served as missionaries in Haiti for 45 years under One Mission Society and were partially supported during part of their time by United Brethren Global Ministries. Ellen had been a resident of the Menno Haven Nursing Center in Chambersburg, Pa., since September 30, 2010. She became a resident there after suffering a fall in 2010 and spending two months in unsuccessful rehabilitation. Ellen was born on July 7, 1930, outside of the town of Herndon, Pa. She gave her heart to Christ around the age of five, and at age 11 sensed God telling her to prepare to be a missionary/Bible teacher. Her studies beyond high school were all directed toward becoming the best teacher she could be. One of her instructors at the Intercession City Bible College invited her to spend a year in Haiti working with a mission the instructor had established. Ellen said she moved ten times in eleven months as she worked in different areas of Haiti. The Creole language of Haiti has at least five different dialects, depending on which part of the country the speaker comes from. While traveling across Haiti that year, Ellen learned Creole and throughout her lifetime was able to identify people by the dialect of Creole they spoke. However, very few were able to identify Ellen’s dialect because she spoke such a universal Creole. When she returned from that year in Haiti, Ellen enrolled at the Transylvania Bible School at Freeport, Pa., north of Pittsburgh. Her three years of study culminated in a three-year certificate for Biblical Studies. In 1979, the school upgraded the value of that certificate to a three-year Bachelor of Theology Degree and at the end of a special convocation week, Ellen was awarded an honorary Doctor of Divinity degree. When the Oriental Missionary Society (now One Mission Society) opened its Bible school in Haiti, Ellen transferred from the correspondence department for the mission’s Radio 4VEH ministry to become a fulltime professor in the school. She taught, at one time or another, every subject in the school’s catalogue and at several times she was assigned to serve as Director of the school. Ellen and coworker Aldean worked together in various job assignments. On January 1, 1963, they were united in marriage. Although they each had their own responsibilities—Aldean in the radio station and Ellen in the Bible School—they helped each other. Ellen served as recording technician in the radio station, and Aldean taught English and provided music training for the Bible School students. 1958: Three-year Bible Certificate (Transylvania Bible School). 1979: Upgrade of Three-year Bible Certificate to 3 Year Th.B. (Transylvania Bible School). 1976: Upgrade of Three-year Th.B to Five-year Th. B. In Allentown, Pa.
1986: Master of Christian Ministry degree (Huntington University). 1991: Master of Arts in Religion Degree (Evangelical Seminary, Meyerstown, Pa.). 1994 – Doctor of Religious Education Degree (Florida). In spite of suffering from fibromyalgia, Ellen carried through with her work assignments at the Bible School in Haiti until the Saufleys retired from missionary service in 2002. At that time, the daily pain from her fibromyalgia prevented her from doing much of the work she would have liked to have done, and her fall in 2010 resulted in her spending her days sitting in a wheelchair or lying in a bed at Menno Haven. Ellen often told her husband that she would like to have engraved on her tombstone the words which our Lord spoke of the woman who anointed his feet in Bethany before his crucifixion: “She has done what she could” (Mark 14:8). 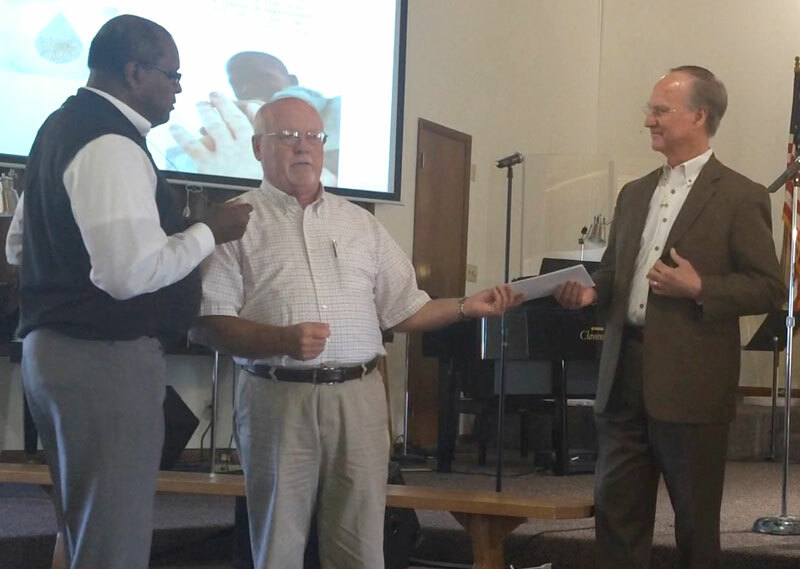 The memorial service for Ellen Saufley was held at 2pm on Friday, September 25, 2015, at Salem United Brethren Church in Chambersburg, Pa.
Bishop John Pessima (right) of Sierra Leone provides us with the following report concerning recent flooding in the Freetown. “You may have heard of the situation in Freetown last week. I was in Bo when it took place and was called by my family to go home because the mission house perimeter wall was badly affected. Part of the wall fell toward the city downhill from the house but fortunately did not damage people’s property. “Secondly, some of our members in the Western part of the city, particularly Faith UB Church in Lumley, were affected. The children there were in school when the flood took place, but thank God no one was hurt. The teachers kept them inside the church while the classrooms flooded. The official numbers have been released for fall 2015 enrollment at Huntington University. It is the largest enrollment over the past five years, with a 5 percent increase from 2014. Residential Campus Undergrads – 934. Graduate Students – 261 (+126 from 2014). Total Enrollment – 1273 (+64 from 2014). There also are 47 international students, which is an increase from 38 students in 2014. With the launch of the Haupert Institute for Agricultural Studies, there are 16 agribusiness majors, 12 of whom are first-time freshmen. Another area to note is that there are 32 new students in the Doctorate of Occupational Therapy program for a total of 64 students. The growth in the Graduate programs was fueled by the second entering class of doctoral Occupational Therapy students, the development of the Master’s in Organizational Leadership, and the launch of the Townsend Institute. On September 13, Morocco Church held its annual Family Fun Fest. We had a wonderful morning service with music and a message from Tom Treece a local man who has a heart to serve the Lord. Following the service the church offered pork sandwiches, salads, along with other goodies. We offered cotton candy, snow cones, face painting, a bouncy house, and other games. Later in the day came our annual homemade ice cream contest. Many of our children who attended VBS attended with their families, along with several other area families. The day’s events were all free and a way to share God’s Love with the community. We praise God for the blessings he provides and the growth we are seeing at Morocco Church. In November 2015, I will lead a trip to Macau as an opportunity to introduce Macau, its culture, and ministry to a few individuals who have an interest in supporting or serving the work in Macau and its staff. I would love for you to join me. Visit our two existing Macau UB churches. Meet with some of our staff who are working in schools in China. Connect one-on-one with local UB church members. Pray with and encourage our current Macau staff. Look for possible connections in the future. Take in as many cultural experiences as possible. On a more personal note, this trip will be a homecoming of sorts. My family and I served in Macau for almost 10 years. I love the people, food, language, and rhythm of that city. Can’t wait to share that passion with others on this trip. I want to build a team of 5-10 people. The dates we are currently looking at are November 11-23, 2015. The sooner that we can firm up numbers and plans, the cheaper this trip will be. Currently, airfare is just under $1000, which is extremely reasonable. We hope to keep the total cost of the trip in the neighborhood of $2500. If you’re interested in joining this trip, I would love to talk to you. You can contact me by email or you can call me here at the Global Ministries office: toll-free (888) 622-3019. I look forward to hearing from you! Global Ministries is sponsoring a number of short-term trips in 2016. Perhaps you would like to participate in one. They involve a variety of countries and needs. Food and lodging in-country (travelers must pay for food in airports to and from the ministry site). Side-trips and entrance fees for special activities in-country. In some cases, special entry visas are needed. In these situations, that price will also be included in the advertised price of the trip. Description: Work on the dining hall at Regent College of the Caribbean. Description: Work at the conference campground outside of La Ceiba. Description: Work on construction of the conference center in Masaya. Description: Construction at Mattru Hospital in Mattru. Description: Conduct five free medical clinics in local United Brethren churches in the Tela region. Description: Two teams will conduct English camps in Spain—one in southern Spain, the other in the Basque region of northern Spain. Description: Construction/sports ministry in southern Spain. Description: Conduct VBS/children’s ministry in Honduras. Description: Work with an English camp in an area of new outreach. Description: Work with CH Global to conduct children’s ministry in UB churches in Guatemala City. Note: Global Ministries can also connect individuals with a medical/construction/children’s ministry team going to Jamaica. Check with the Global Ministries office for more information. Dr. Jody Bowser (right) has been appointed as senior pastor of King Street UB church in Chambersburg, Pa. King Street is the second-largest United Brethren church, with a weekly attendance of over 1500. 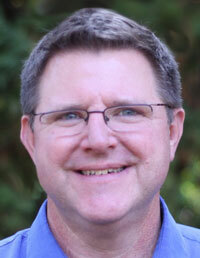 Dr. Bowser has been senior pastor for over 12 years at Moses Lake Alliance Church in Moses Lake, Wash. His ministry experience also includes five years as youth pastor at First Baptist Church in Visalia, Calif., and over ten years as director of Student Ministries and Preaching Associate at The Chapel in Akron, Ohio. He and his wife, Caryn, have six children, three of whom currently attend Christian colleges in Ohio and Pennsylvania. Their oldest son, Jay, is on staff as a video producer at a church in Charlotte, N. C.
Jody’s doctor of ministry degree, with an emphasis on preaching, is from Gordon-Conwell Theological Seminary in South Hamilton, Mass. His doctoral preaching studies were done under Dr. Haddon Robinson. Jody’s first Sunday in the pulpit at King Street will be November 1, 2015. King Street Church is excited to see where God takes us under Jody’s leadership. The congregation has been without a senior pastor since Dr. John Beukema left in January 2014 to become pastor of a church in Houston, Texas.